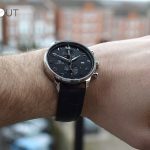 Published by Joshua Clare-Flagg on 22 Mar, 2016. 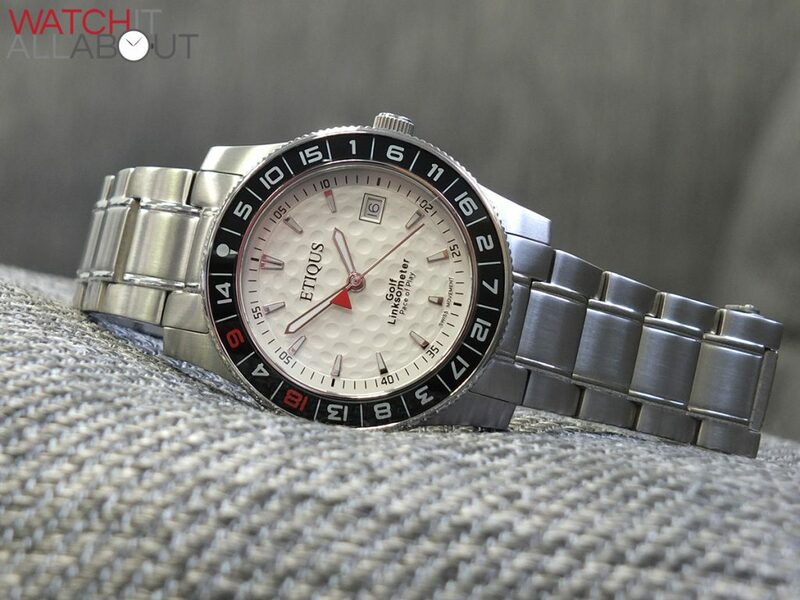 Etiqus have just released a new addition to their golf timepiece collection, the Sport Tour. 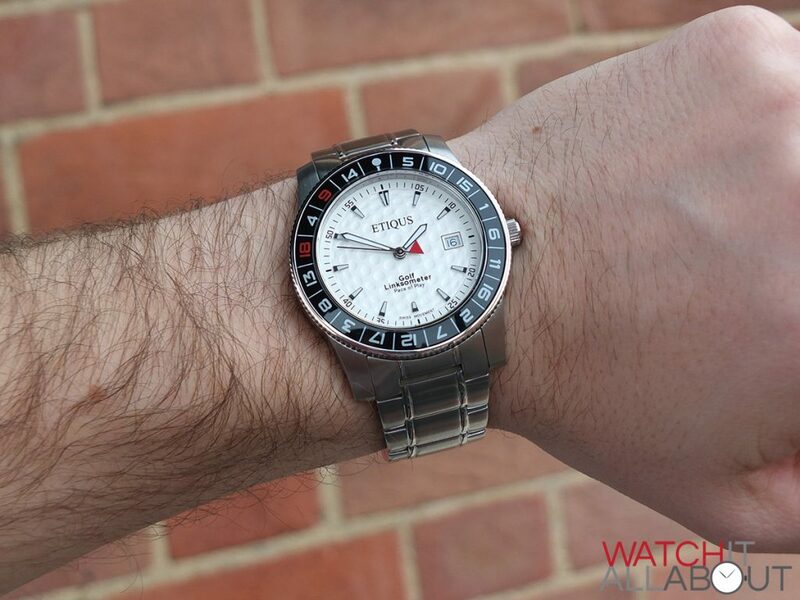 Costing £279, it’s a smaller and smarter affair when compared to the 45mm Sport Pro. Therefore, it’s likely to be a very popular model for Etiqus. 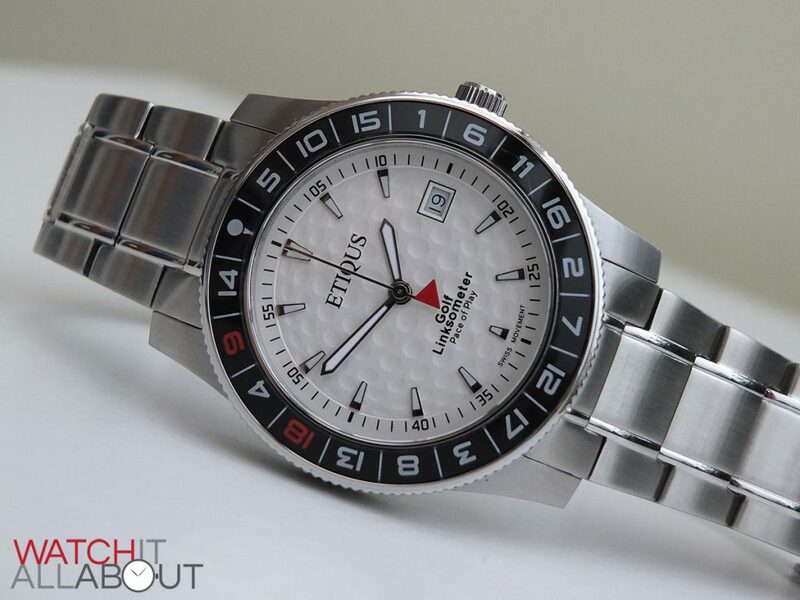 Obviously as is the case with all of the Etiqus range, it has a specific target market – those who enjoy the game of golf. 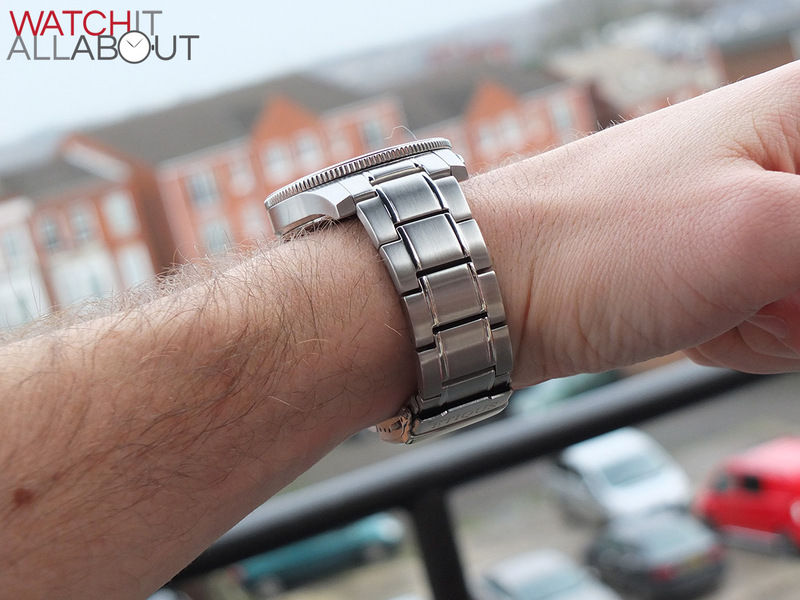 Let’s take a look at how it stacks up as a watch. The case is a fairly straight forward and simple affair. 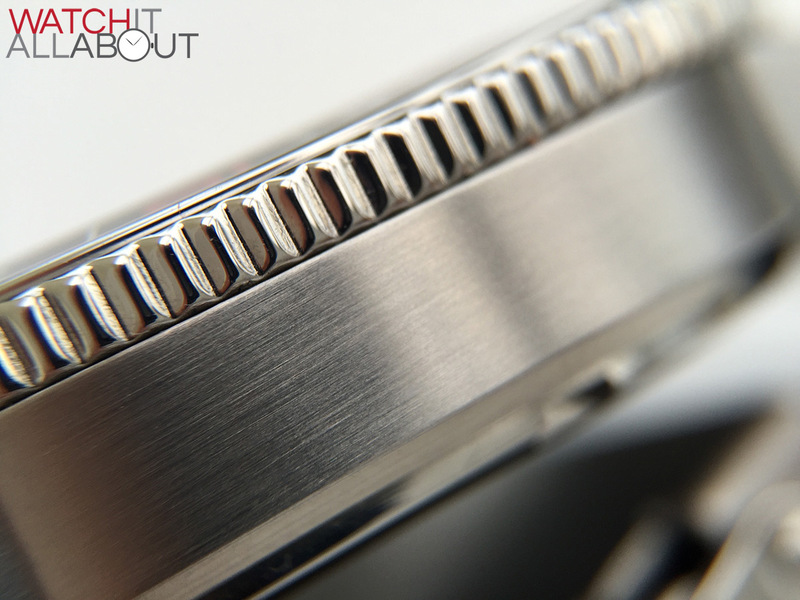 It’s a fully brushed barrel shape, with long curved lugs. 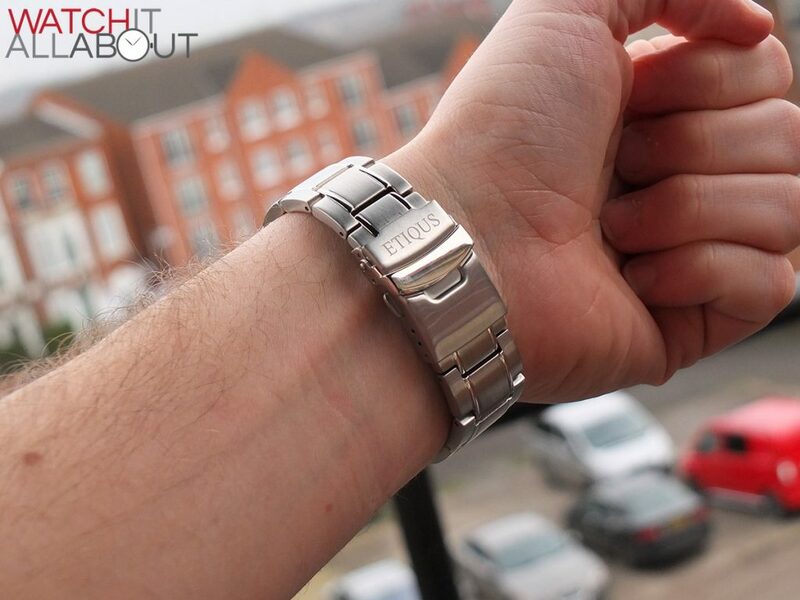 The push-pull crown is unsigned and has a polished end, which delivers a mix of finishes. 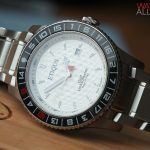 The finishing is good, it seems like it’ll be quite resilient to knocks or scratches. 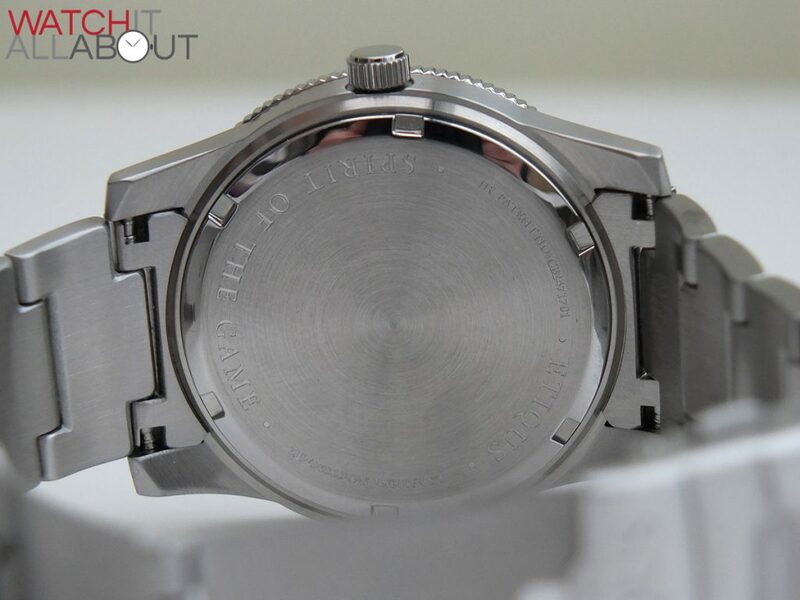 The caseback is also extremely simple; fully brushed bar a polished ring around the outer edge, and the watch specifics deeply engraved around the circumference. 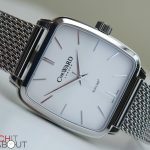 The sapphire crystal is very good quality: it has super clarity, and a decent anti-reflective coating. 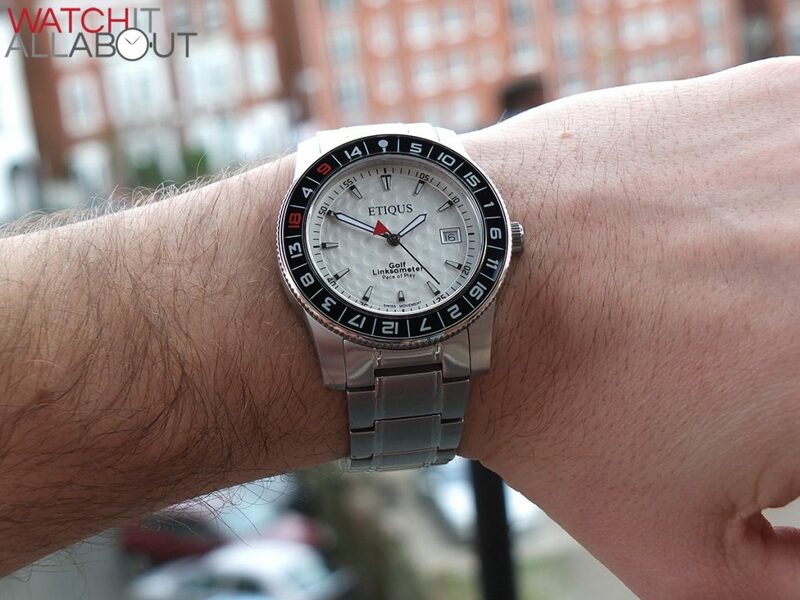 I think it makes the difference on an affordable watch and it’s impressive on the Etiqus Sport Tour. 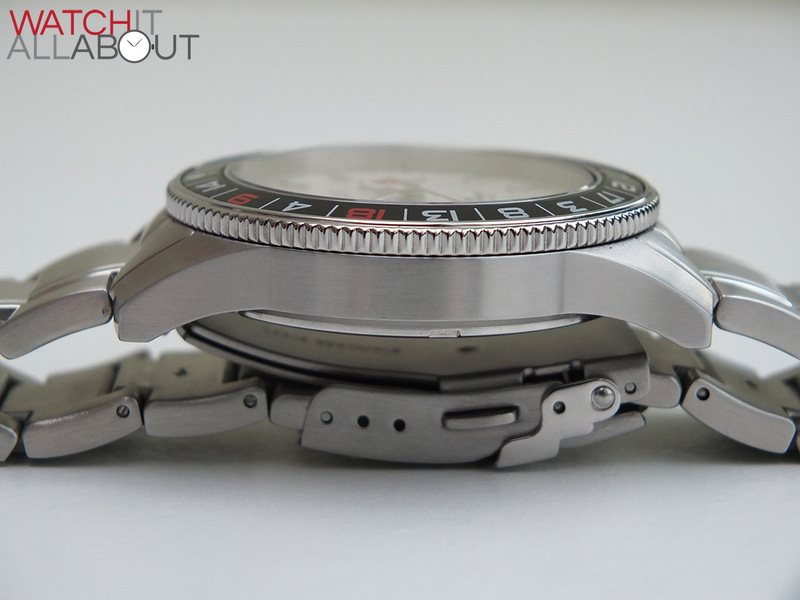 The main feature of the case is the Butler Bezel: a patented design by Gary Butler, the founder of Etiqus. This is a way of keeping tabs of where you should be on a 18 hole course based on the well regarded belief that it’ll take about 4 hours to complete. 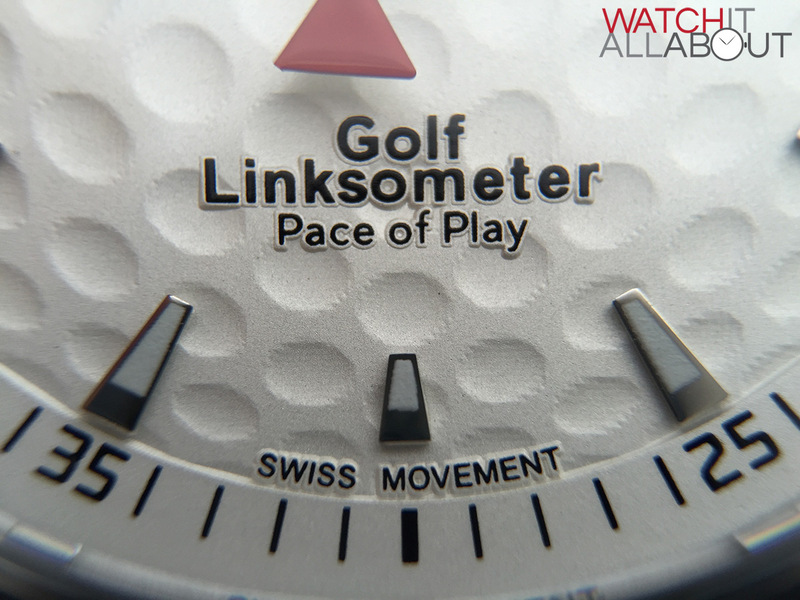 Basically, you set the tee-off point (the ball on a tee at 12) to the minute that you start your round. 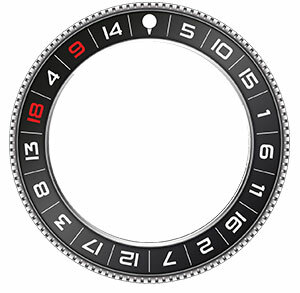 As the time advances, you should be completing that hole as the minute hand goes within that section. Obviously it’s not perfectly accurate, as some holes are longer or more difficult that others, but it’ll keep you up to date with how you’re getting on throughout the round. It’s an excellent idea, and one that deserves recognition – kudos to Gary for thinking up an idea like this and seeing it out. 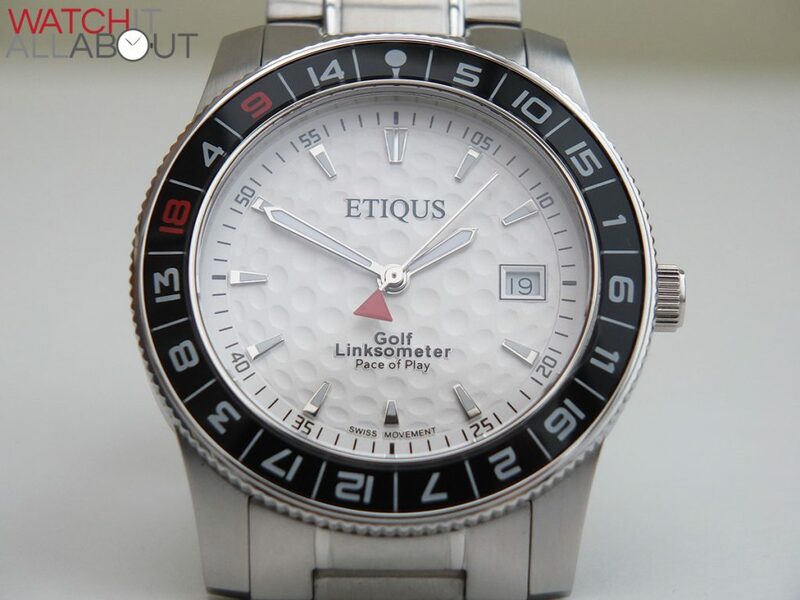 The main thing of the dial that’s noticeable is the golf ball dimple effect. To the naked eye it looks great – it only really starts looking a bit “pixely” under the macro lens, and even then it’s not that bad. So it’s pretty impressive to have made this effect so well. 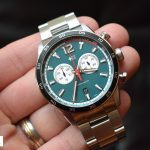 But that’s not the only golf inspired element on the dial; the second hand is a red hold flag pointing left, just like what’s on the Masters logo. 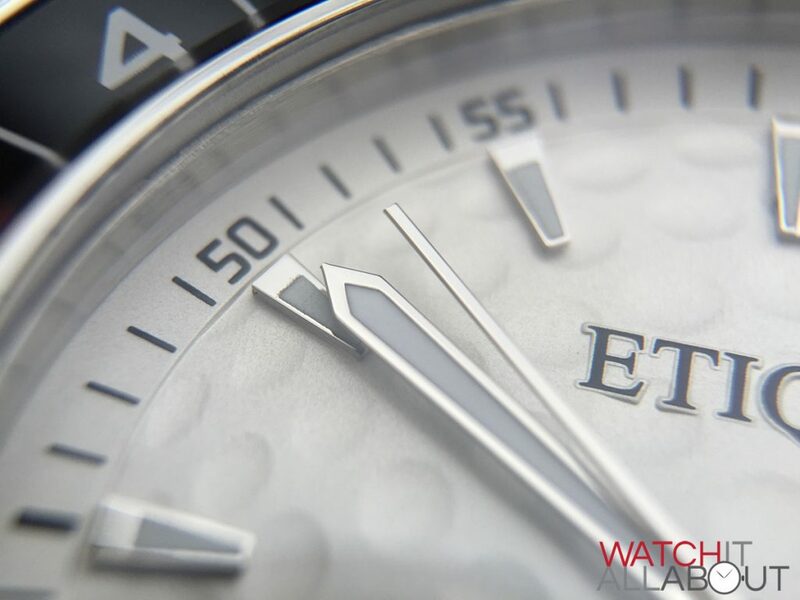 The applied hour markers are made to mimic tee batons, and are accurately made and applied. They have a lured centre and a polished surround, matching the hands and producing a nice reflection in the light. I feel that the hands are a nicer shape than on the Sport Pro, mainly because they’re a little bit more subtle and classy looking, thanks to their sword shape. 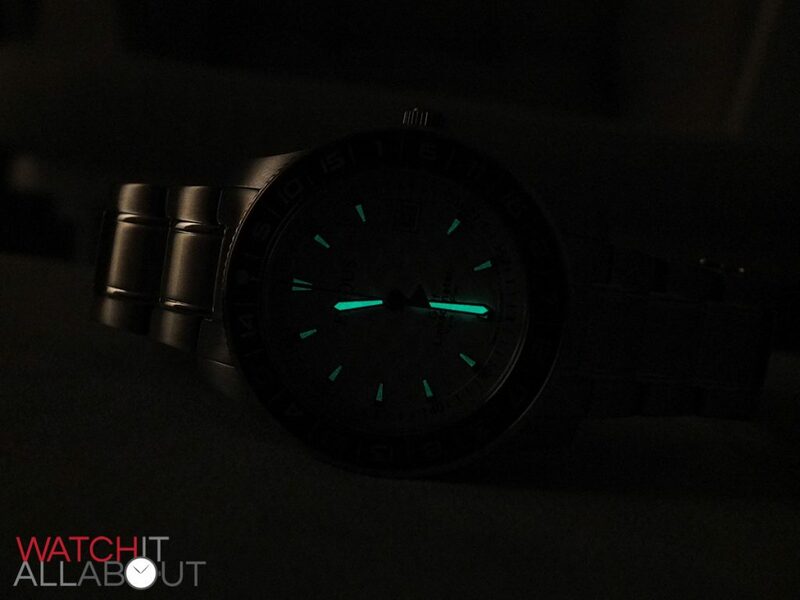 The lume on the hour markers and hands isn’t the best; it doesn’t glow too bright, nor does it charge particularly fast. 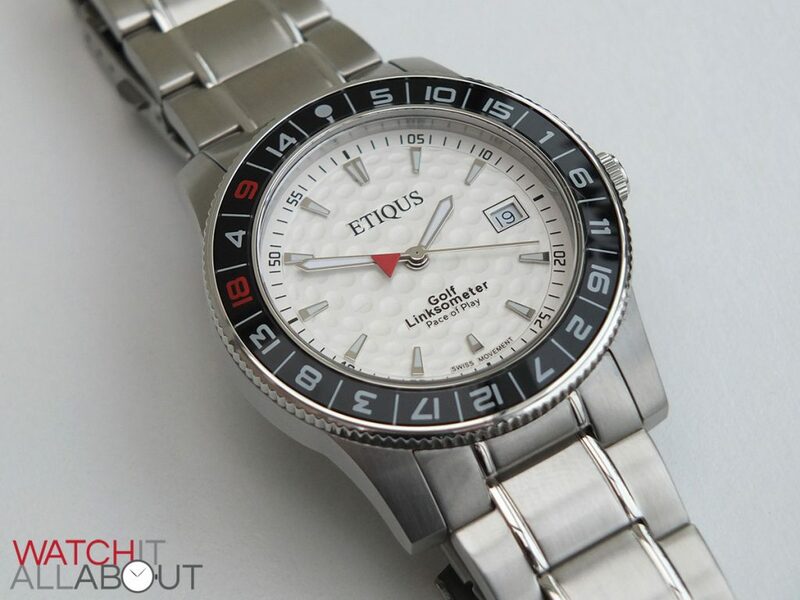 The printing across the dial is all accurate, and I like it when a little plateau is used on a textured surface so the print is on a flat surface, increasing accuracy and legibility as is the case on the Etiqus Sport Tour. The date window is located at 3, and has a pleasantly made border surrounding it to split it up nicely from the dimple effect. 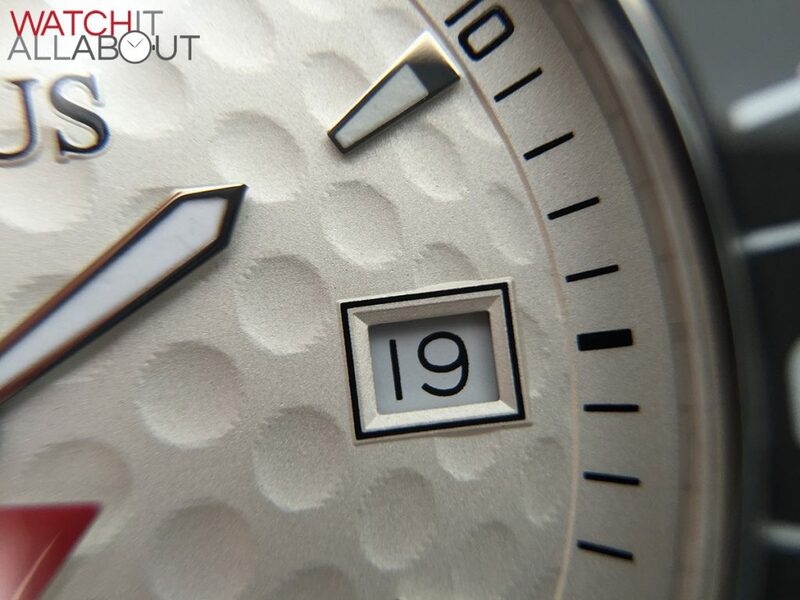 To summarise, the dial is well executed, with a couple of key golf design cues that will be appreciated by golfers. 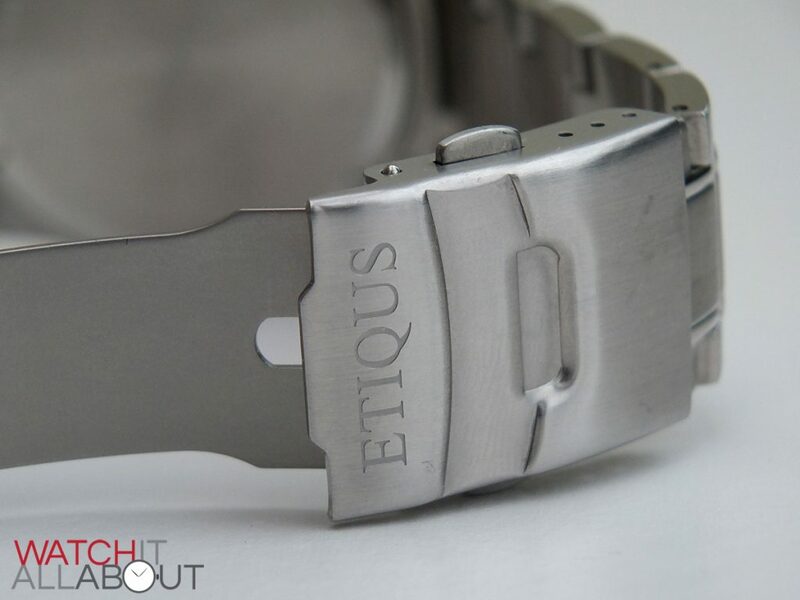 The bracelet measures 22mm wife at the lugs, tapering down to 20mm at the buckle. 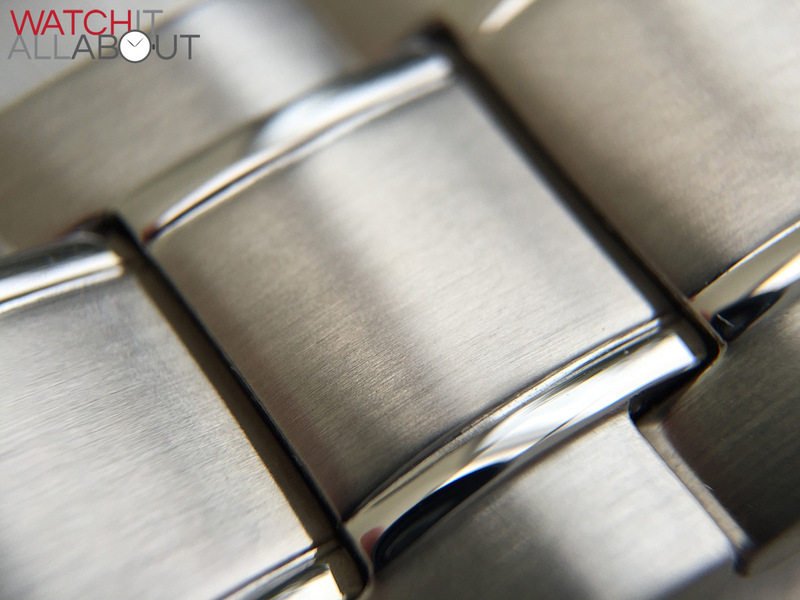 The links are chunky and well machined, with two polished lines going along the entire length of the bracelet – very much like what you’d find on a Tag Carrera. 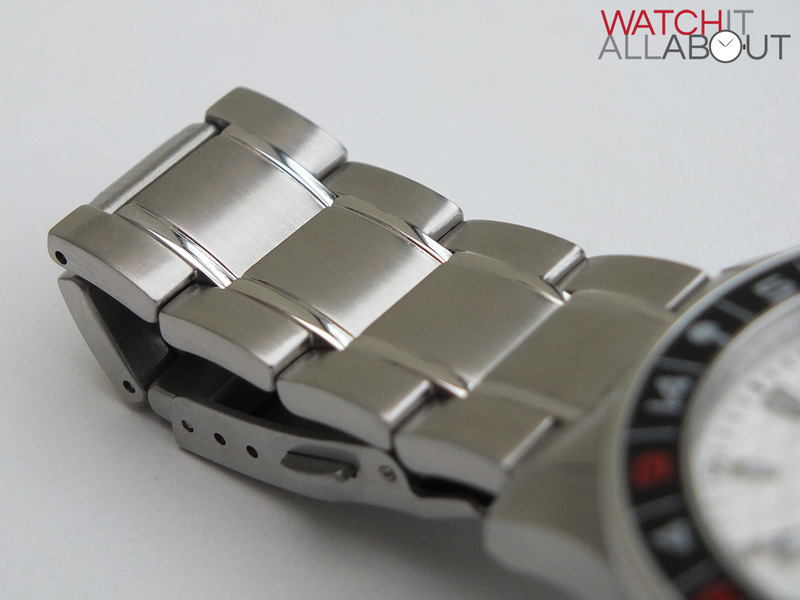 It’s comfortable to wear, and is also very secure thanks to the double locking clasp. 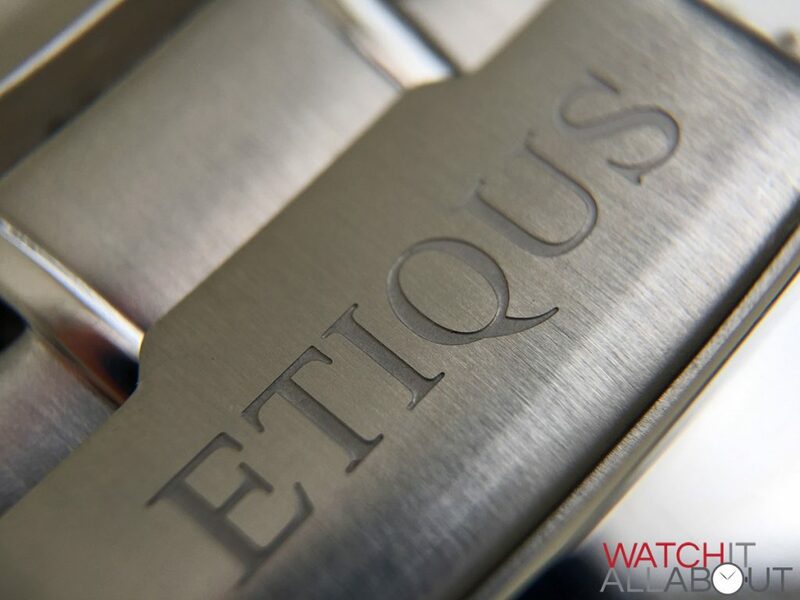 The clasp is rushed on top with the Etiqus logo deeply engraved on the top edge, and the locking flap is fully polished to keep things interesting. 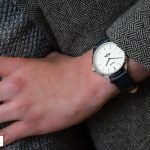 The bracelet is ultimately well made, styled correctly to match the case and watch in general, whilst being comfortable and dependable. 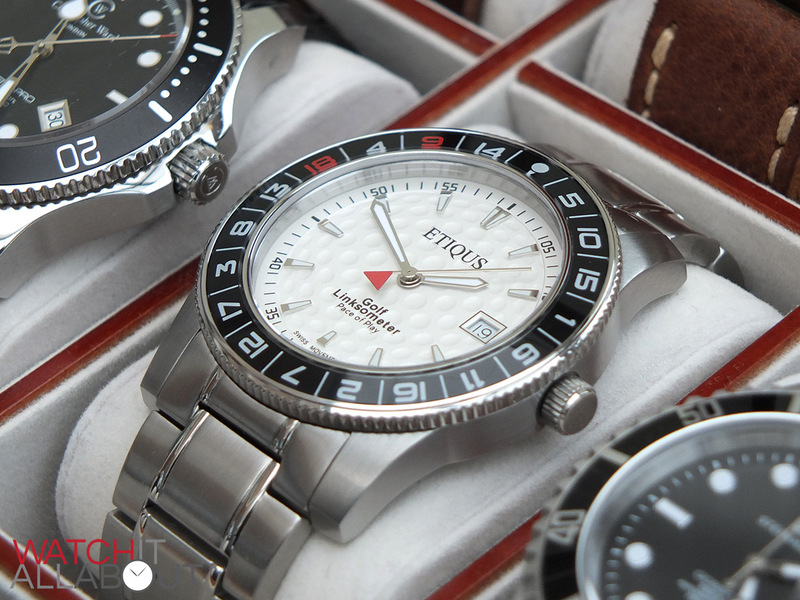 The movement powering the Etiqus Sport Tour is the Ronda 6003D. 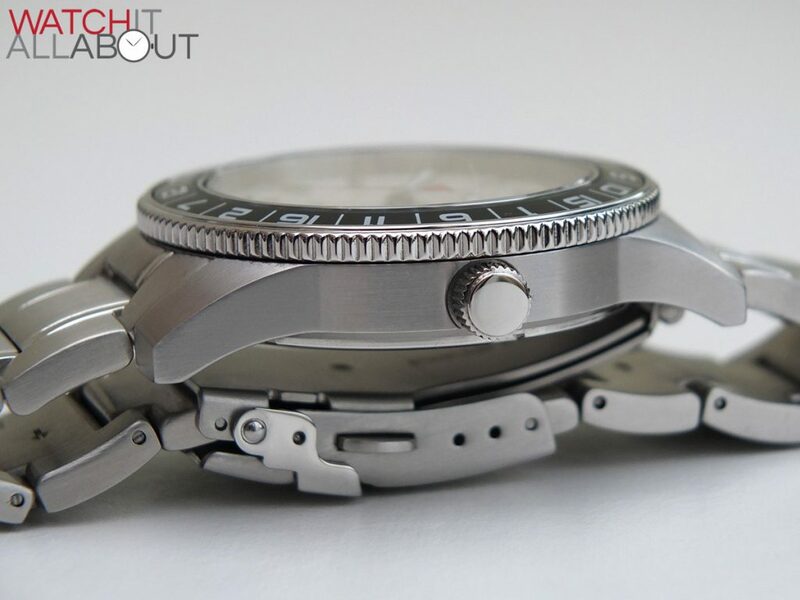 It’s a simple, hard working, reliable Swiss Made quartz movement. It has a 3 and a half year battery life so you’ll get plenty of use out of it before having to change the battery. 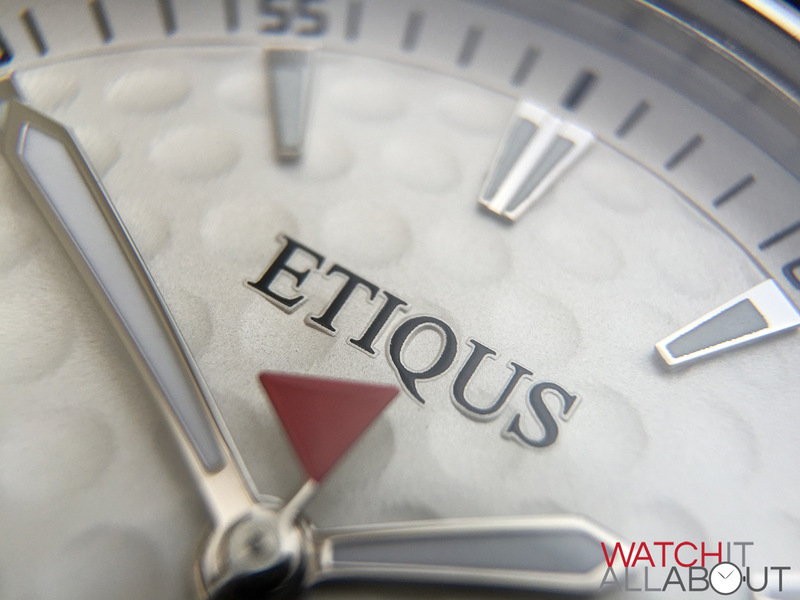 As a watch, the Etiqus Sport Tour is well built and neatly designed. 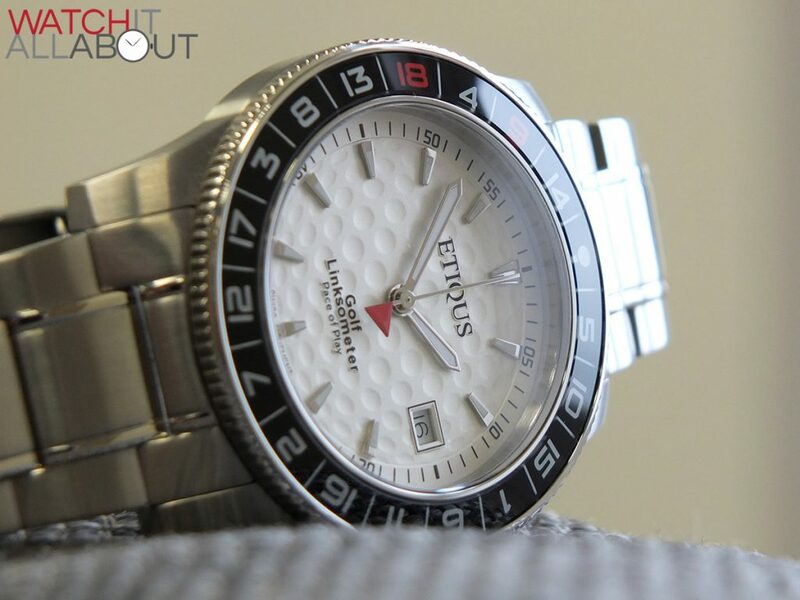 The golf ball effect on the dial is an effective visual component and the Butler “pace of play” bezel is a genuinely useful insert. 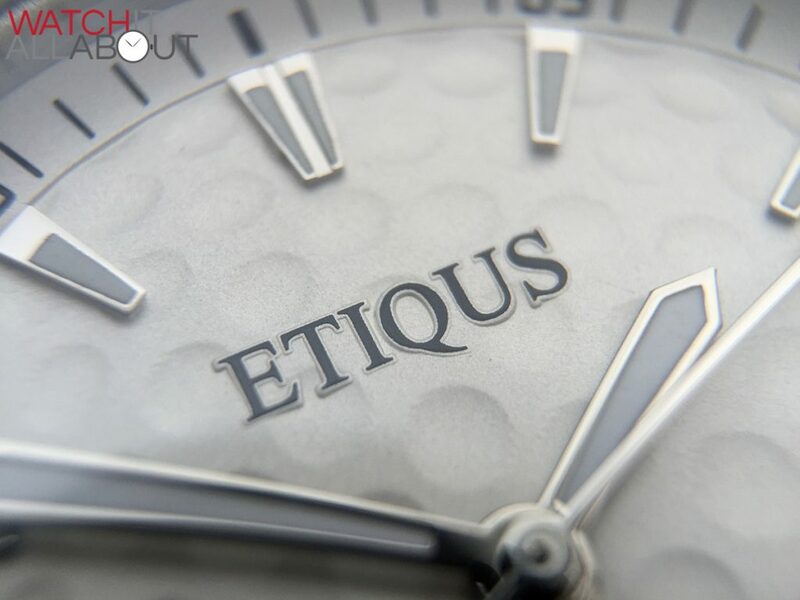 Not forgetting Etiqus are a UK brand, plus the addition of a Swiss Made movement and very good sapphire crystal make it a must for any golf lover who is after a timepiece inspired by the great game. I’ll repeat what I said earlier. If you can contact us we can resolve your issue. As we don’t have a customer record for ‘Gordon Smith’ we are unable to contact you. 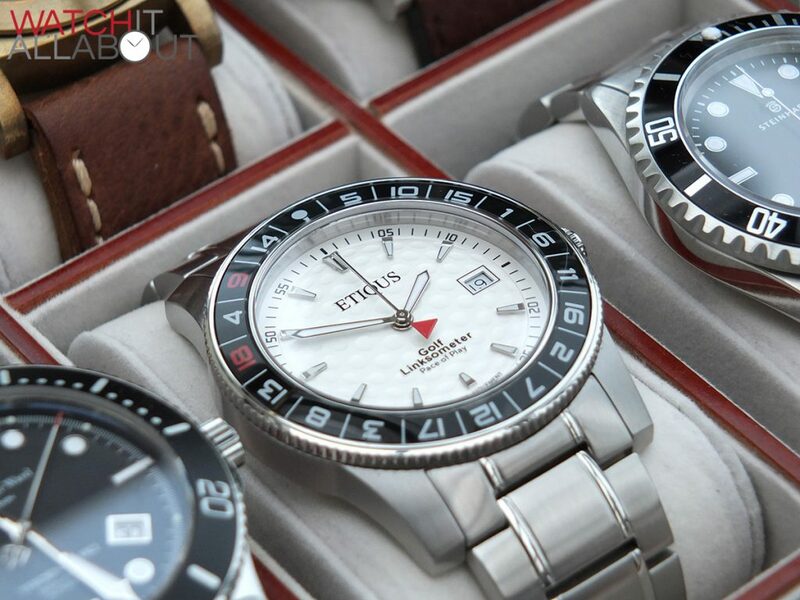 Perhaps your watch was bought for you and is in the name of someone else. We are trying to help you but without contact details we are struggling.